We hope your week is off to a good start. The time change has brought some blessings (and also some ‘curses’), but overall it’s a good thing. 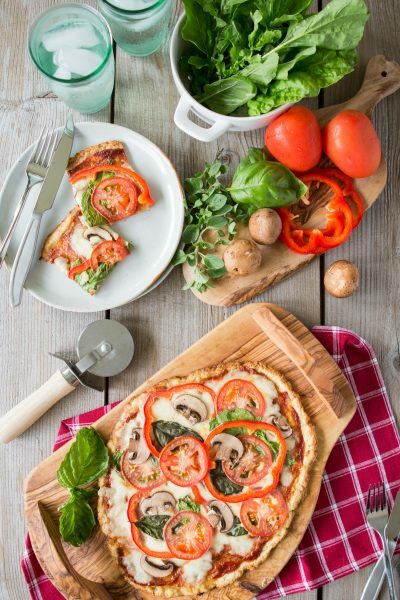 We love getting an extra hour of daylight at dinner time, because it means we can make pretty food for dinner and take a photo to share with you guys! Prior to the time change, we would have to be serving dinner at 5:30 to get a picture in daylight. Now… we can eat at a normal time like 6:30 or even 7, and get a photo of the dinner. So great! Plus, afternoon and evening activities outside are so much better with the extra hour of light. We -should- be inside working. But that’s impossible right now. 70, sunny, and a slight breeze. 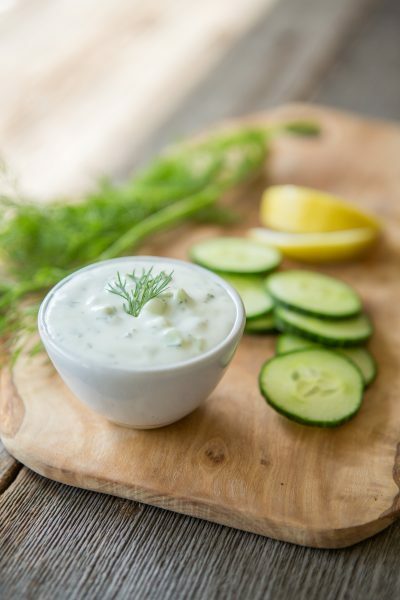 All that’s missing is some lemonade! (Speaking of Instagram, we just hit 100k followers today, and are hosting a giveaway! Be sure to enter!) 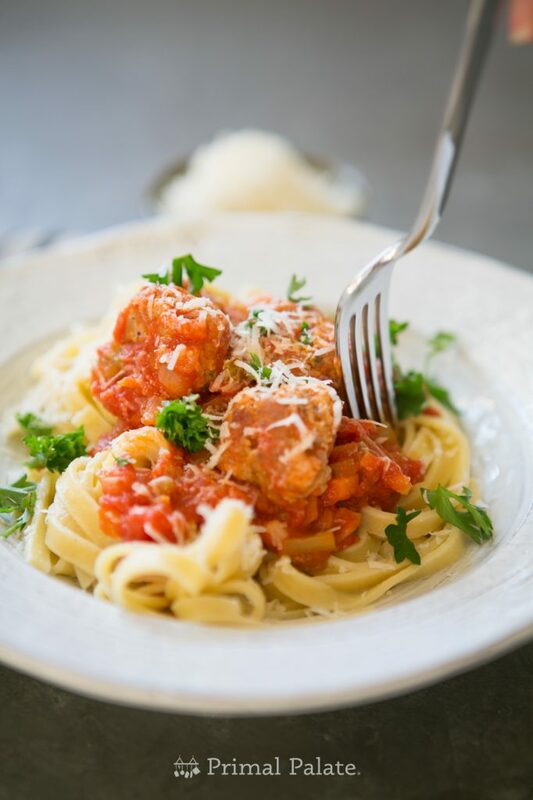 After a few hours in the yard, we came inside and pulled together our current favorite meal – making pasta with marinara and meatballs. 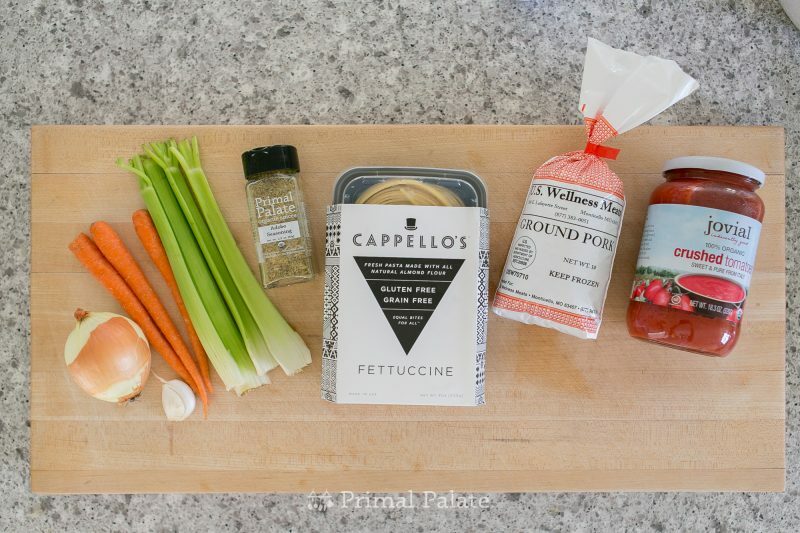 Now, this isn’t a ‘sponsored post’ – but you’ll see that we use a lot of our favorite brands in making this dish: US Wellness Meats Pork, Cappello’s Fettuccine, Kasandrinos EVOO, and our own Primal Palate Organic Spices. We don’t know anyone at Jovial (the brand that makes the crushed tomatoes) but we love that stuff too! 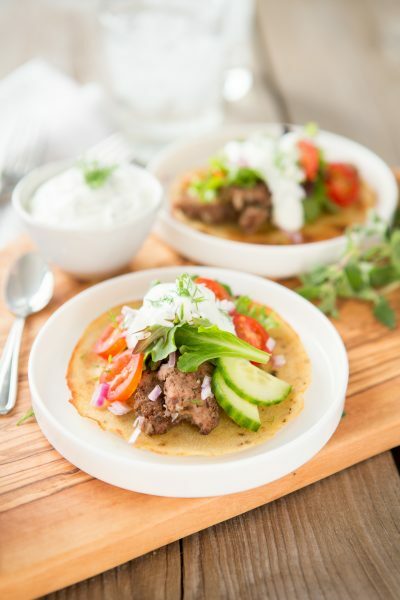 The result is a super clean, super flavorful dish that we’re absolutely hooked on. 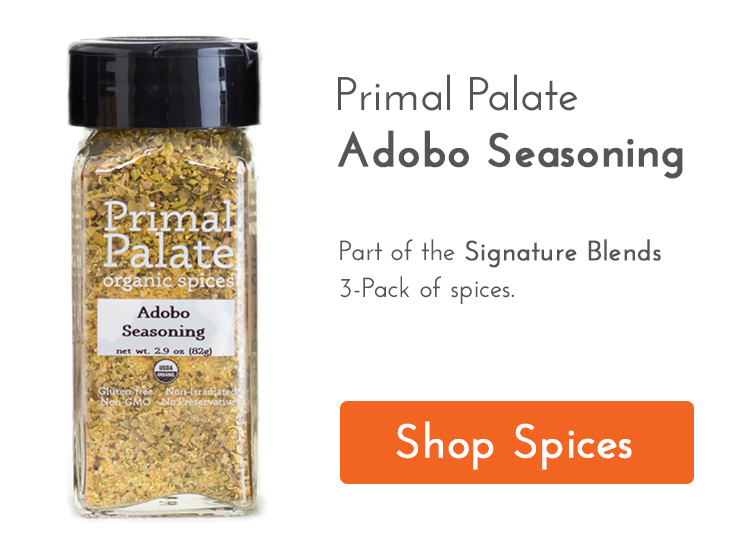 The secret ingredient in this whole recipe is our organic Adobo Seasoning. 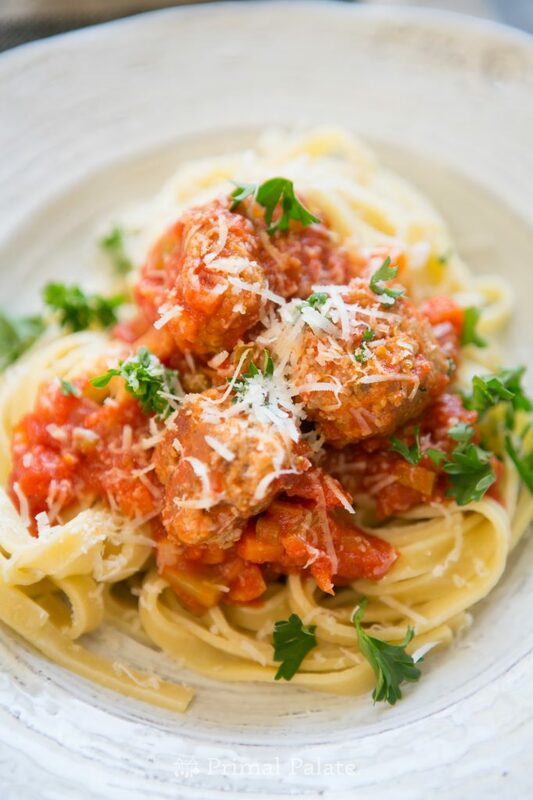 We mix it into our meatballs, and the flavor just seeps into the entire sauce and makes it downright amazing. 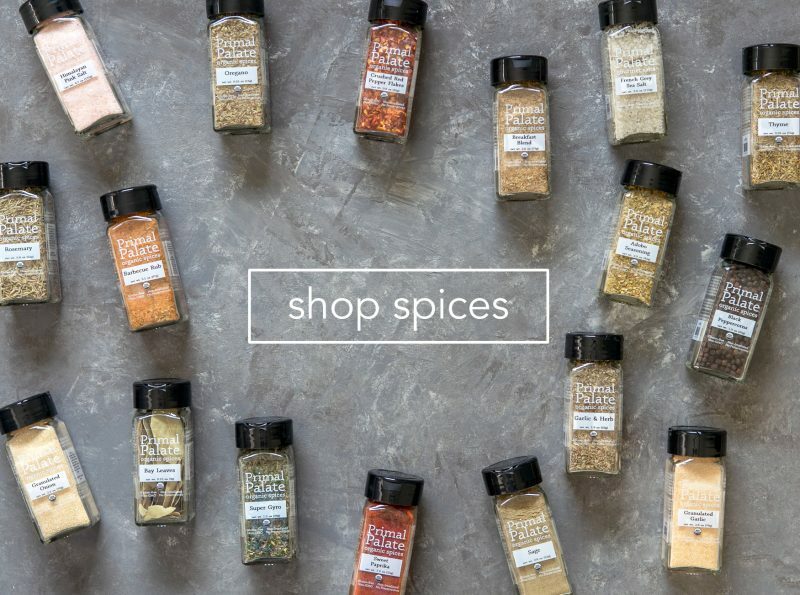 Adobo sound exotic, but this balanced spice contains common spice ingredients that make so many different types of dishes taste great: Pink Himalayan Salt, Garlic, Onion, Black Pepper, Oregano, Turmeric. 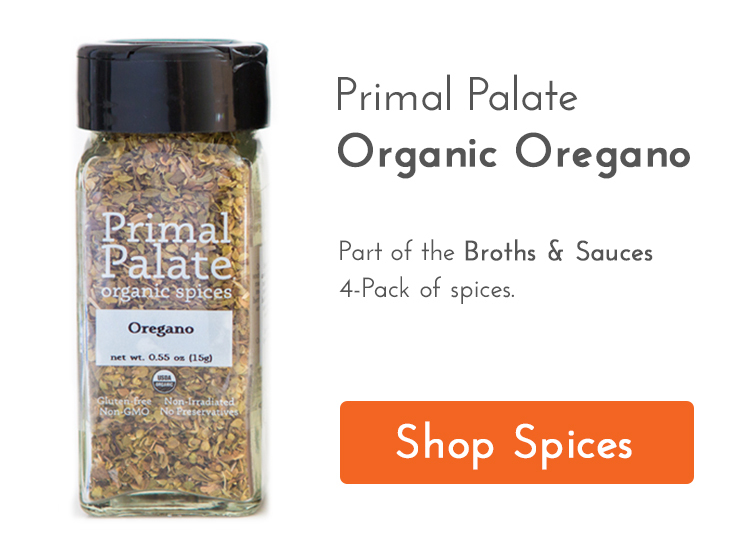 (Wanna buy those ingredients and mix up your own batch? You can do that, too.) 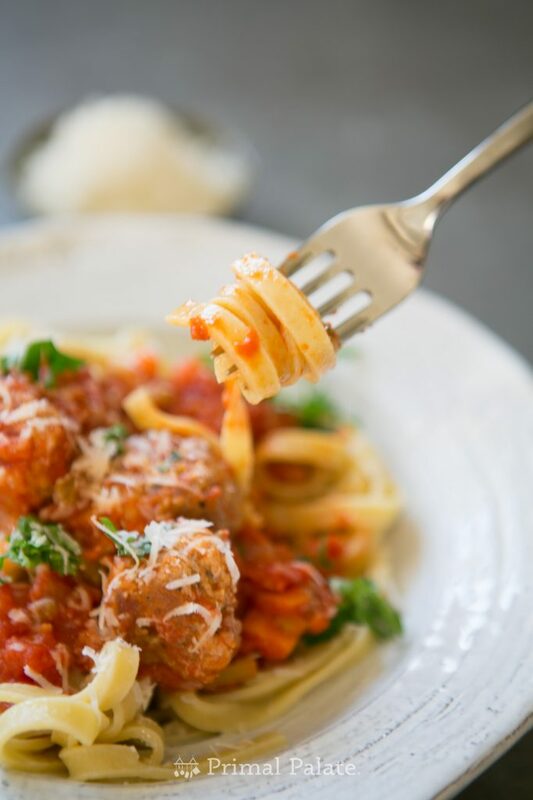 The result is one of the best tasting meatballs (and sauces) around. Sear the meatballs on all the sides, then add it to the sauce. Just don’t add the fat from the pan. It won’t be an improvement. 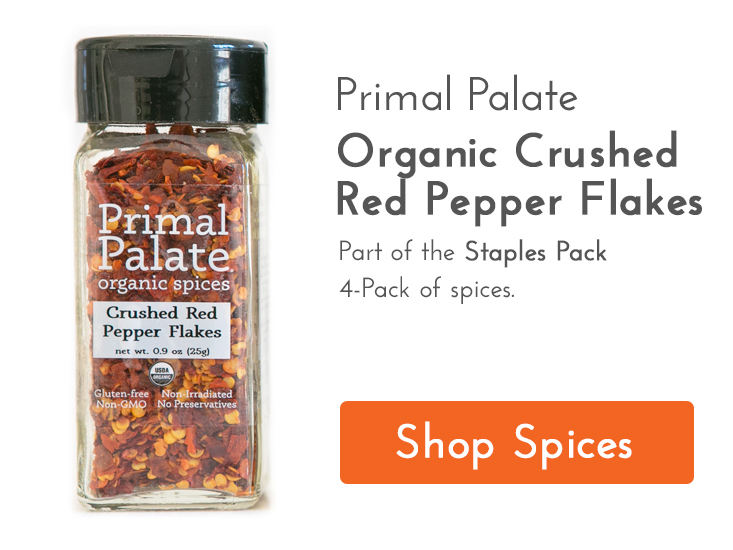 For an extra kick, we add our new Crushed Red Pepper Flakes, along with some Oregano (which is a great flavor-booster for Italian food). 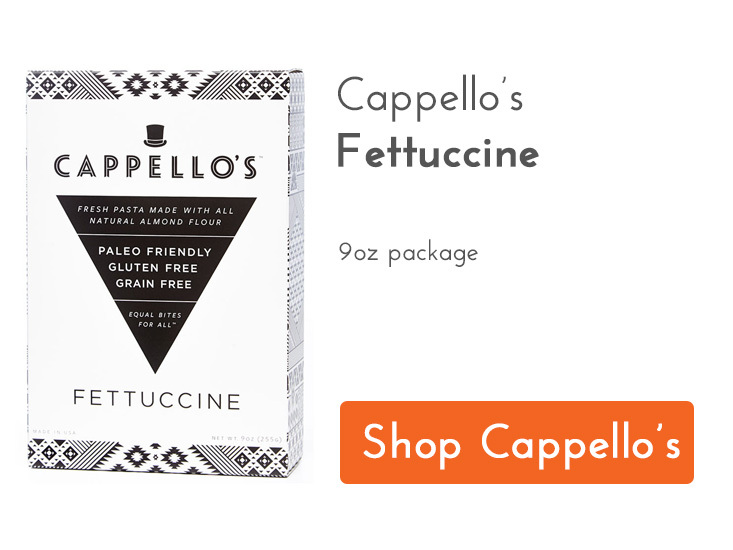 Cappello’s is a company we’ve been fans of for many years now. 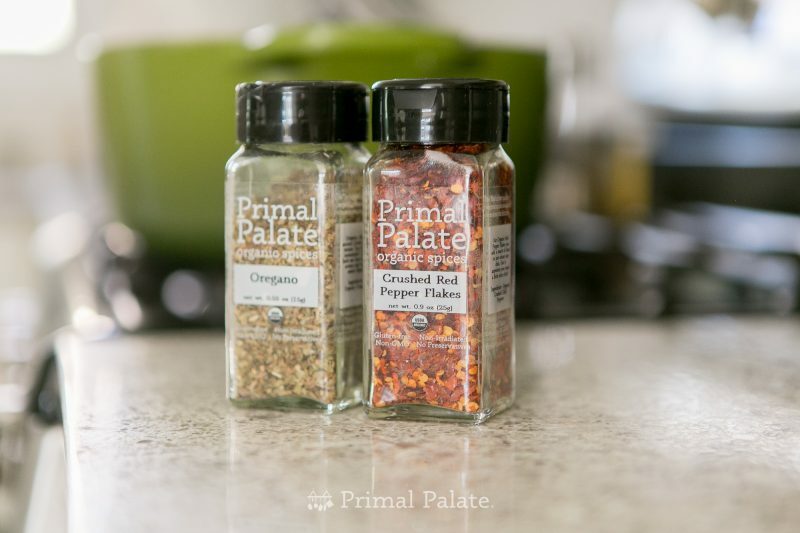 After they appeared on the Paleo scene a few years ago, we approached them as a partner to produce our awesome Chocolate Chip Cookie Dough, which has won over people everywhere. 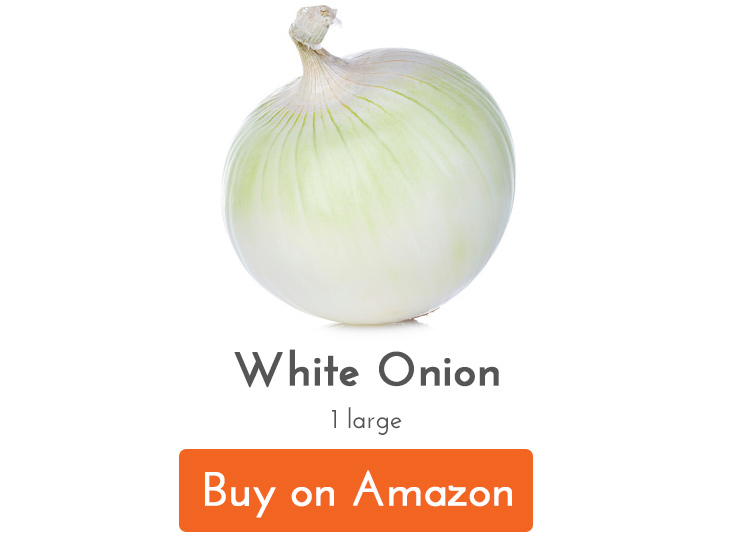 It’s in a ton of stores, and also available online in “binge packs” on their website. They don’t call them binge packs, but they should. They should also call them “Cookie Dough push pops” … but that’s a discussion for another time. 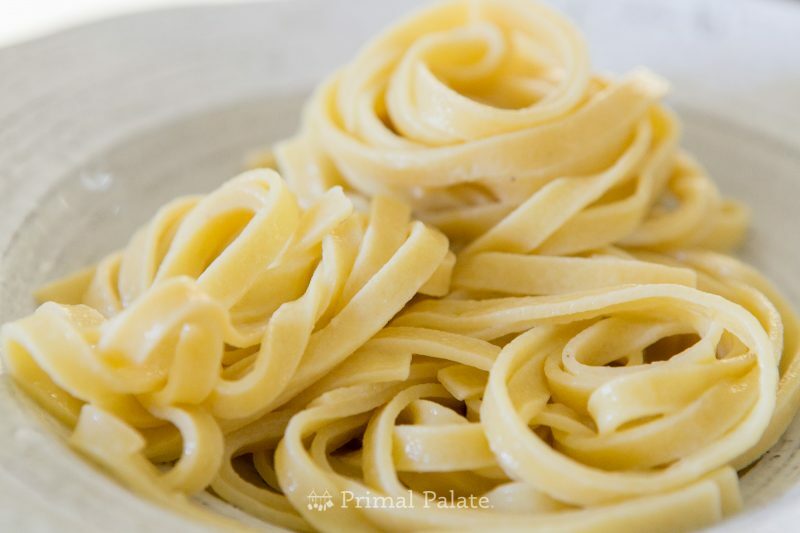 Their pastas are a little different to work with than traditional pastas, and even gluten-free or rice-flour based pastas. 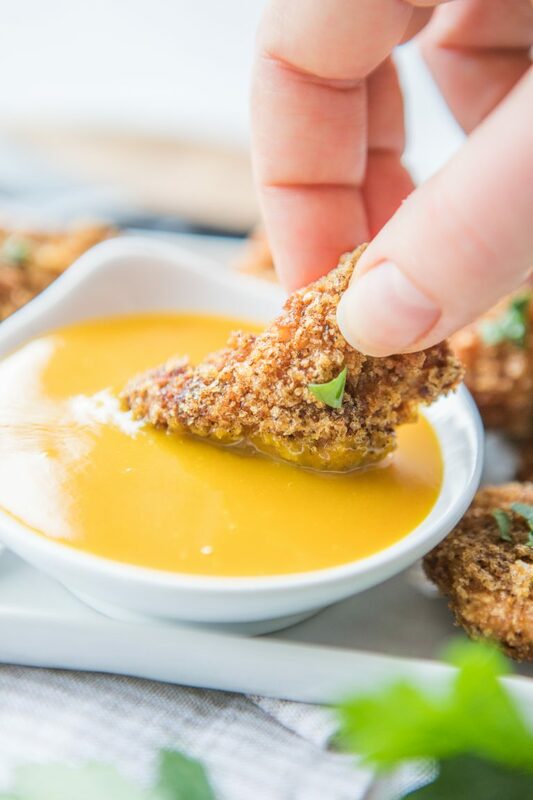 They are almond flour based, and cook super quick. Like 90-seconds-quick. 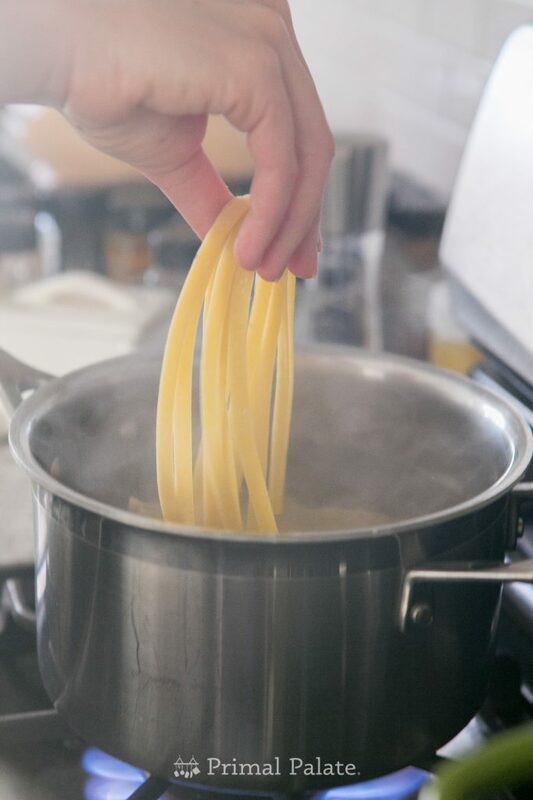 We cook ours for about 2 minutes, and it’s less al-dente. 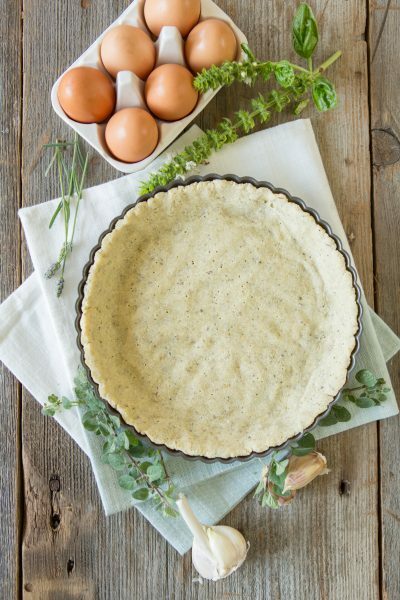 This is a definite perk if you already feel like you spend too much time in the kitchen. Keep it sort of teased apart and swirling around for best results. 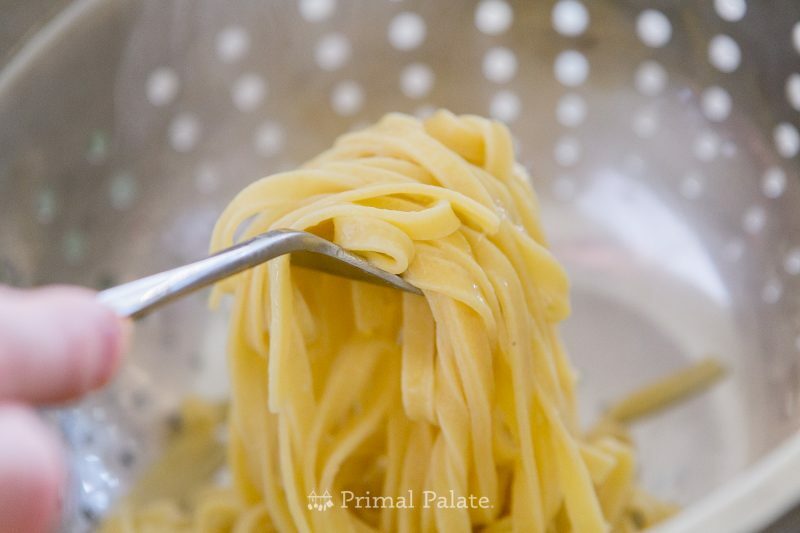 After straining it, with give a little drizzle of olive oil to keep it from sticking. 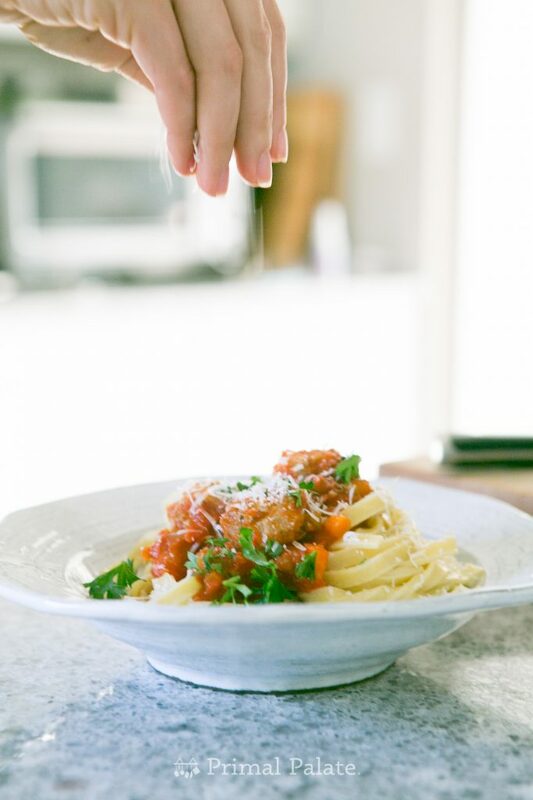 For plating this dish, used a serving fork to make twists of the fettuccine… a food styling trick that makes pasta look pretty. 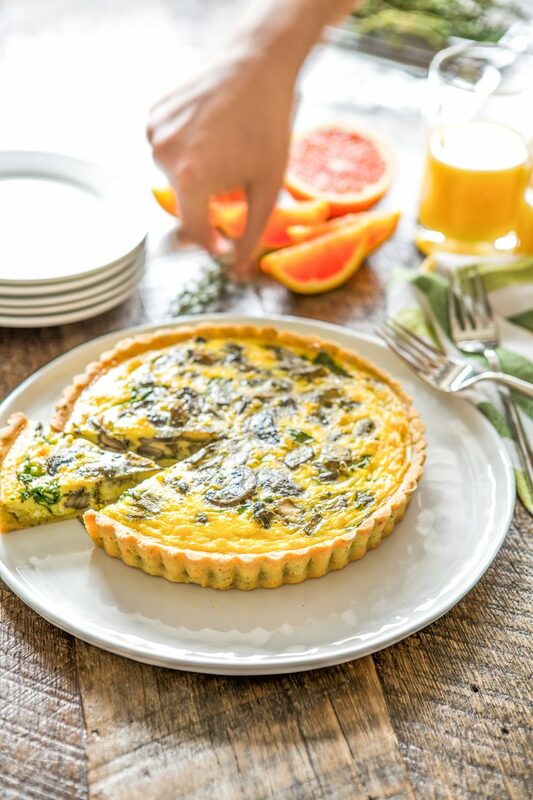 If you like pretty food, you can do this too. To finish off the dish, we grated some sheep’s milk parmesan cheese, and rough chopped parsley. 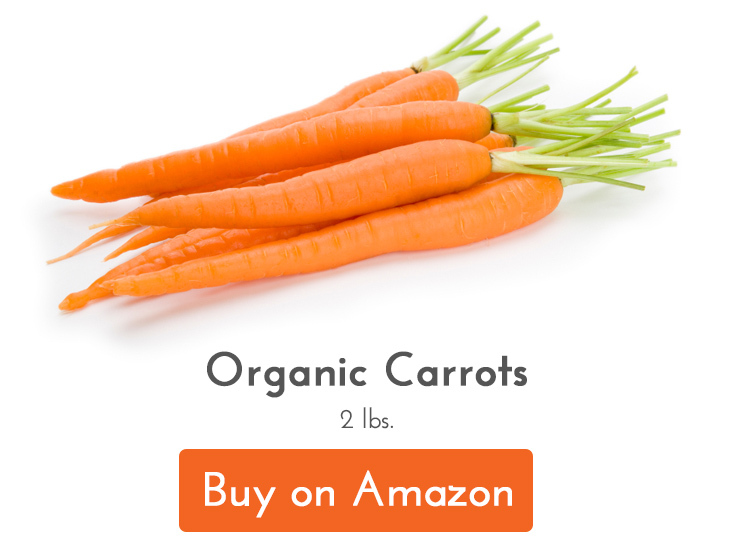 Start off by peeling and dicing the onion, carrot, and celery. Peel the garlic. Add the extra virgin olive oil to a large soup pot over medium heat. Add the onion, carrot and celery - stirring occasionally until softened. Add the garlic, and gently saute for a few more minutes. The edges should get golden, be careful not to let it burn. Add the 18 oz of crushed, organic tomatoes to the pot and stir. Add 6 oz of filtered water to the tomato jar, shake around to get the extra bits of crushed tomato, and add this water to the pot. Add the oregano, and crushed red pepper flakes to the sauce. Bring to a moderate simmer (medium low heat), and stir occasionally while the sauce reduces. 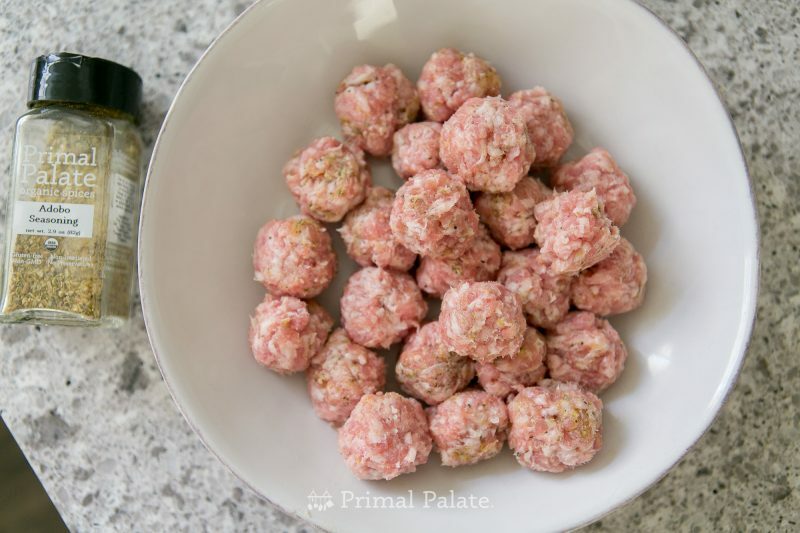 While the sauce is cooking, prepare the meatballs. 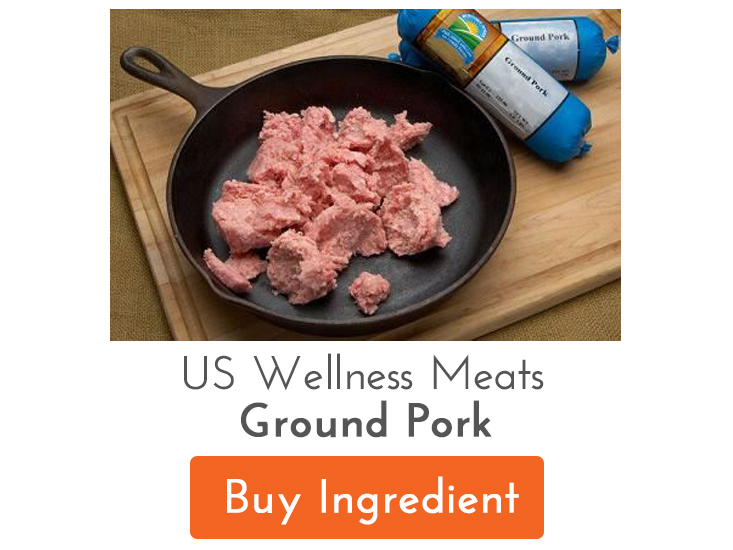 Mix 1lb ground pork (we like US Wellness Meats) with 2 teaspoons of our organic Adobo Seasoning. Mix thoroughly, then form into meatballs the size of your choosing. Heat a large skillet over medium heat. 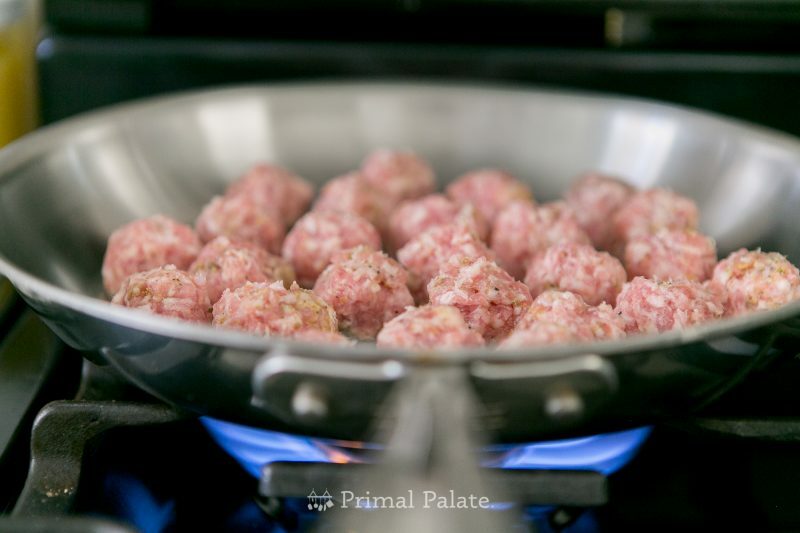 and place the meatballs gently into the pan (this will help them to not stick as much. The pork fat content will do the rest!) 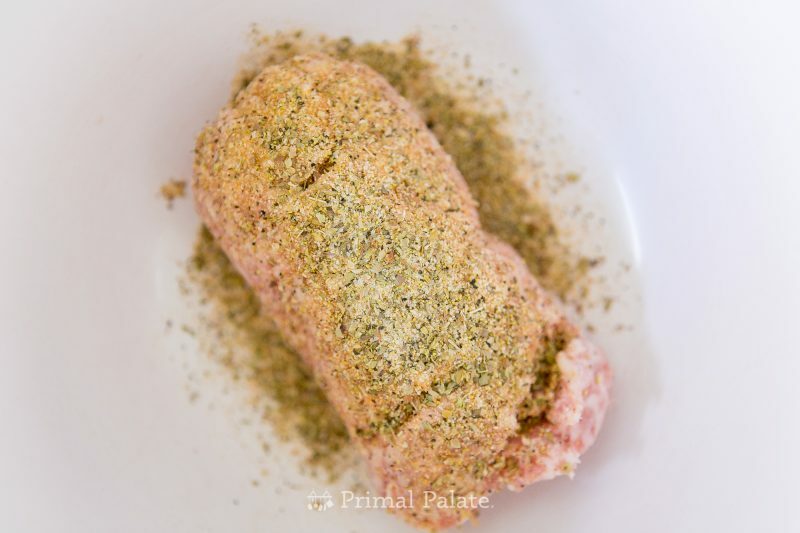 Roll around to sear all the sides (about 2-3 minutes per side). After they've seared, add them to the sauce with tongs. If you dump the skillet, you'll also get a ton of extra fat, which is not going to help the sauce.... trust me. 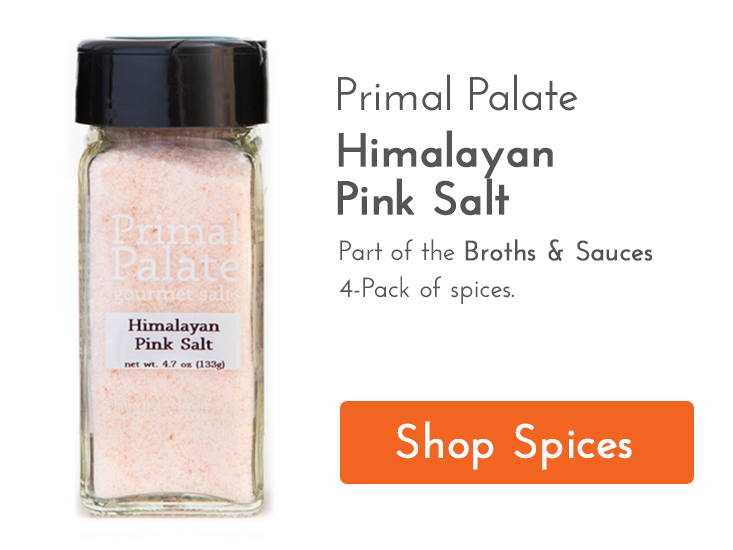 After they've cooked another 10-15 minutes, season to taste with Himalayan Pink Salt. 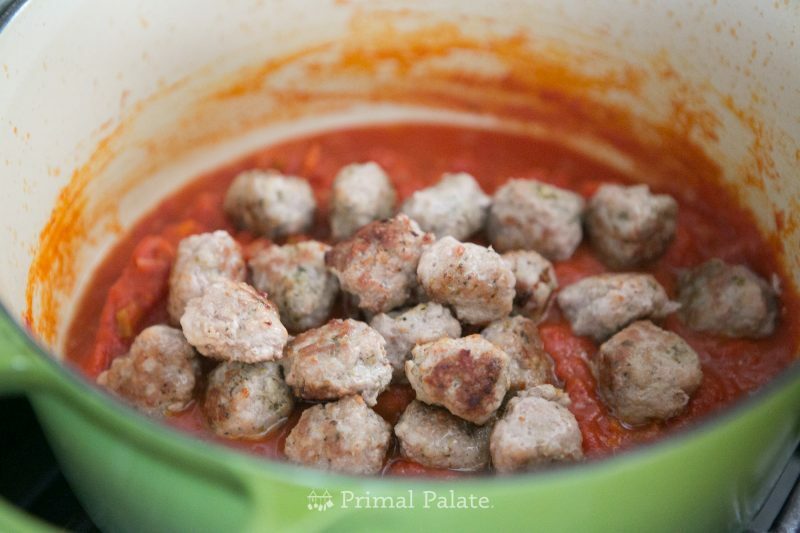 Toss the meatballs in the sauce, and continue to simmer. 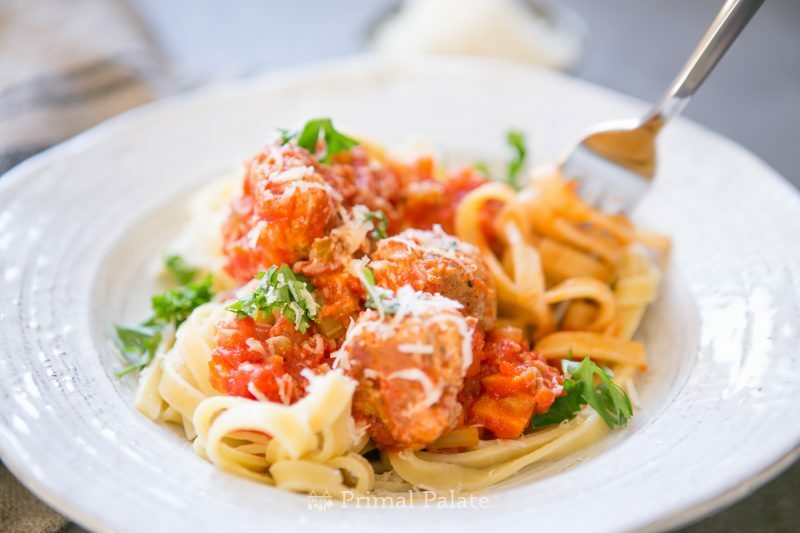 Try to get the meatballs buried down in the sauce so they continue to cook. 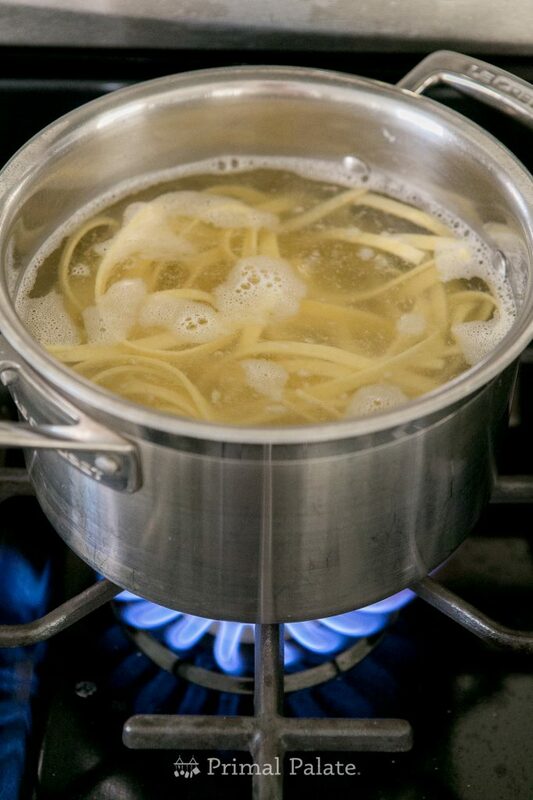 Bring a medium pot of water to a rolling boil, and cook the Cappello's Fettuccine for approximately 2 minutes. Their packages say 60-90 seconds, but I prefer a slightly less al dente texture. Cook to your liking. 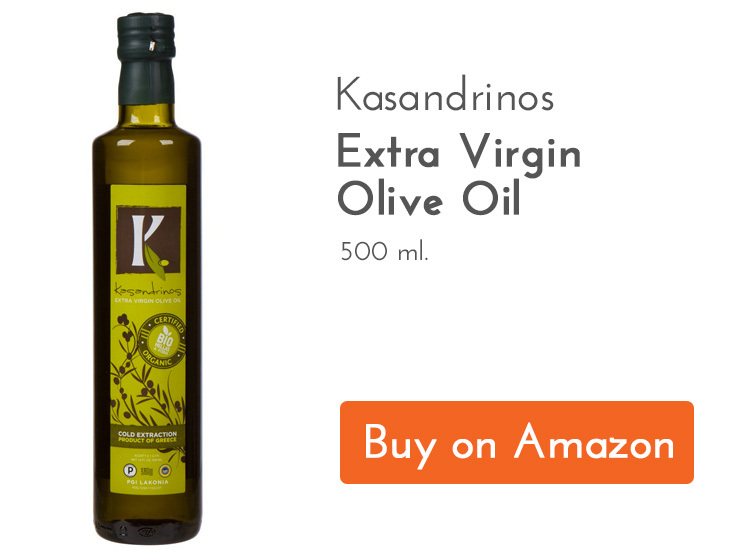 Strain, and toss with a tiny amount of high quality Extra Virgin Olive Oil to keep it from sticking together. 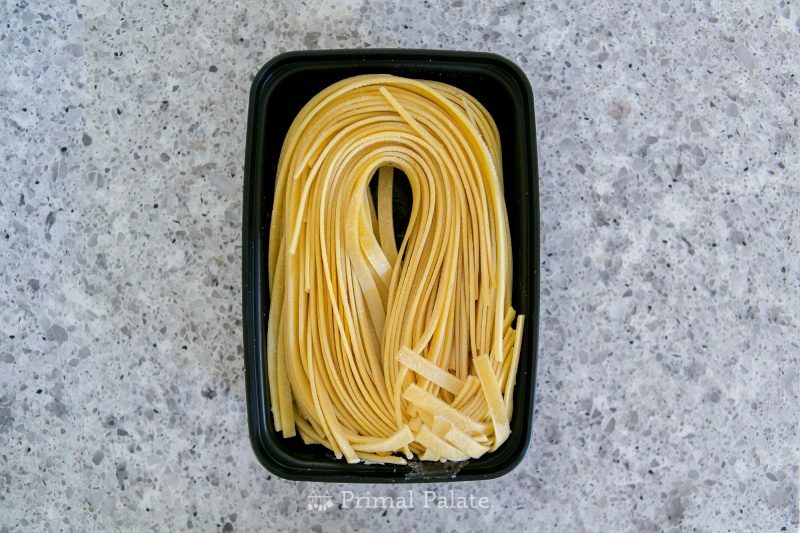 To bring it together, use a large fork to twist "curls" of fettuccine onto a plate. Top with the meatballs and sauce. We finish ours with a grating of fine sheep's milk parmesan cheese, and some fresh parsley. Enjoy!